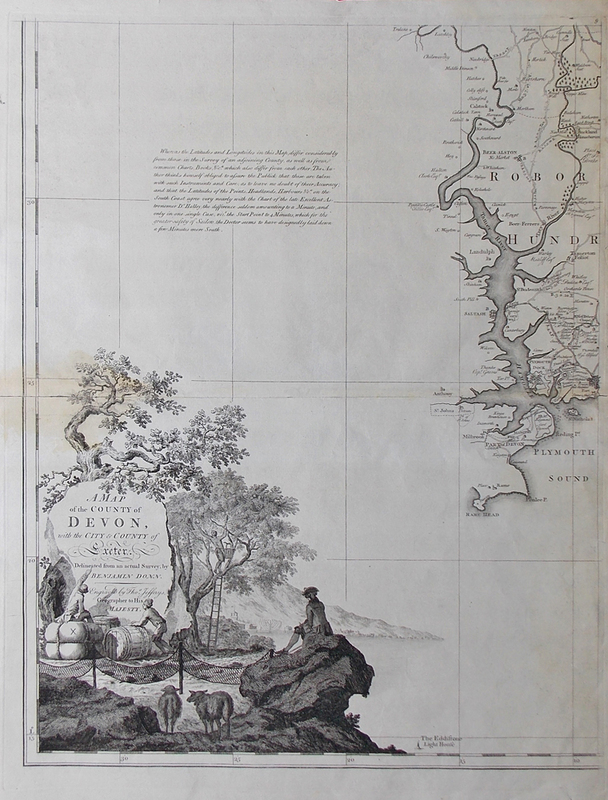 Description: Sheet 12 from the large 18th century map of Devon. Condition: Good bold imprint, generous margins, folding copy, reinforcing to centrefold, frayed right margin with repairs, stain centre left. 25 x 18.5 " approx. In 1759 the Royal Society of Arts, then known as the Society for the Encouragement of the Arts, Manufactures and Commerce, offered an annual award of £100 for the best original 1" to 1 mile county survey. Donn and Isaac Taylor's (Dorset) submitted entries, but Benjamin Donn was the first successful applicant, with a twelve sheet map of Devonshire, engraved by Thomas Jefferys and published in 1765. A Devonian, Donn was a well-known mathematician as well as a surveyor and teacher of mathematics in Bideford, before moving to Bristol. Also interested in tidal flows he published a set of figures for the South West of England. Thomas Jefferys (1719-1771) was one of the most important engravers of the eighteenth century. His considerable output covered the entire field of printing from maps to satires and portraits. Learning his trade as an apprentice with Emanuel Bowen. He produced several other large scale county maps which proved expensive to produce and may have contributed to his bankruptcy in 1765. Robert Sayer and latterly William Faden joined forces with Jefferys, giving financial assistance to the business and in Faden's case leading to an eventual takeover after Jeffrey's death in 1771. Eighteenth century map of Plymouth and River Tamar by Benjamin Donn.